1. Divide dough into 4 equal parts. 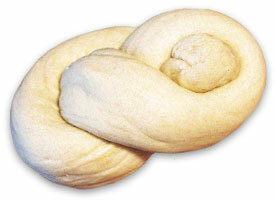 Knead each part into a smooth ball and roll each ball into a ropelike strand. Lay the strands side by side and pinch together at the top. 2. Grasp the leftmost strand and pass it to the right, under the two strands adjacent to it, and then back toward the left, over one strand (the one closest to it now). 3. Grasp the rightmost strand and pass it to the left, under the two strands adjacent to it (which have already been braided), and then back to the right, over one strand. 4. Alternately repeat steps 2 and 3. 5. When done braiding, pinch the ends of the strands together. 1. Form a ball of dough and roll it into a long, ropelike strand, about 12 inches (30 cm) long and 1 inch (about 2 cm) in diameter. 2. Form a loop with one long end and one short end, as shown. 3. Thread the long end through the loop. 4. Pinch the two ends together on the bottom of the roll. 2. Arrange the strand as shown. 3. Grasp the short end in your left hand, and with your right hand pass the long end under the short end. Thread the long end through the loop, from the top of the roll to the bottom. Send us pictures of your original braiding techniques or challah designs and we’ll be happy to publish them on our site. 1. 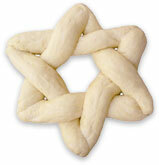 Place the dough in front of you, before it has been formed into any sort of shape. 2. Some have the custom to give charity or wash hands (netilat yadayim) without a blessing before fulfilling the mitzvah. 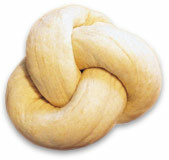 This is a favorable time for personal requests and prayers (see prayers for Hafrashat Challah). It is the custom to stand while performing this mitzvah. The piece of dough can be of any size. The custom is to separate a kazayit – 28 grams (approximately one ounce), or the size of a ping-pong ball. 5. Burn the separated dough or wrap it in two layers and discard it. It is preferable to burn the piece of dough that has been separated, but not in the oven. If the challah is burned on the gas range, it should first be well wrapped in aluminum foil so that the dough does not touch the grate. Another option is to place the piece of dough inside a tin-can and burn it on a lit gas range. 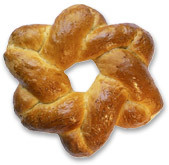 If burning the challah cannot easily be done, it may be wrapped in two layers of a material such as aluminum foil or plastic bags and discarded.